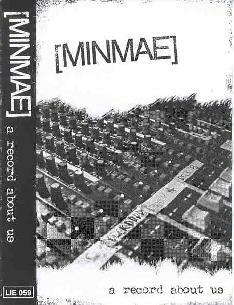 Minmae - "A Record About Us"
Portland, Oregon based Minmae (aka Sean Brooks) has become my hands down favorite of the homemade lo-fi artists. The music is mostly song oriented, but there's an enjoyably raw feeling to the songs while maintaining a dreamy atmosphere. Minmae do a good job of combining somber moods and pleasant sounds and melodies. The cassette opens with "Kelly In SE", a catchy lo-fi rock tune with an ethereal quality. "One Of Us Has To Go" starts off with a much harder edge but evolves into something dreamier and more psychedelic. And speaking of psychedelic, "Hear Me Out Girls" is a totally tripped out song with whining cosmic guitars, spaced out bubbling UFO synths, and an excellent melody to glue it all together. My favorite track of the set. Side B of the cassette has a very different, and far more sedate, version of what I guess is the same song. And "Girls' Reprise" is similar but returns just a wee but to the spirit of the spaced version. "Circumspect. I Followed It" has some cool grungy garage guitars that I liked. "Prese And Cutting Board" is an interesting quirky tune with a Lou Reed feel. "Bear Loved Ruiner" is a pulsating, melodic instrumental. And "That Cloud Over There" is a simple song with a slow guitar melody and a hypnotic accompanying electronic wave of sound. A fine set. If you dig the lo-fi scene then Minmae is a band you're sure to enjoy. You can visit Minmae at the Try Not To Look Records web site at: http://www.creativecompute.net/airbornevirus.